"A Texas fisherman got the fright of his life when a 2.5m shark jumped into the back of his boat without warning. 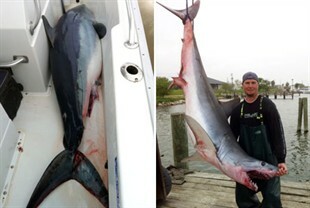 Jason Kresse, 29, was dumping fish guts over the side of his boat about 80km offshore when the shark jumped aboard, the Associated Press reports. The 170kg mako shark thrashed violently aboard the 7.5m boat as Mr Kresse and his crewmates tried and failed to get the giant animal back overboard about 3.45am on Monday, local time. "All of a sudden something hit the side of the boat," he said. "He ends up landing on the back of the boat." The shark died several hours later, damaging the boat in its struggle to escape. Mr Kresse needed to get a forklift to get the animal off the boat. It is now on display at a seafood business in Mr Kresse's hometown of Freeport." (Source: http://news.ninemsn.com.au/world/8230852/shark-leaps-into-fishermans-boat?cmp=nl_news_31march2011_7&mch=newsletter ) Video footage can be seen at http://tracking.msadcenter.msn.com/cegnngia_nruobodrnh.html . It includes further footage of an eagle ray that jumped in to a boat.